[Beauty Secret] Everyone loves Cleansing Balms, so I decided to make my own. I discovered the existence of cleansing balms back when Jourdan Dunn first revealed her entire skin care regimen. Her cleanser of choice was moringa cleansing balm by Emma Hardie. That was over a year ago. I vowed to pick up that cleansing balm but never followed through. Fast forward to this week when I a received notification that Teyana Taylor had launched an Instagram live video. She was sitting in the back of an Uber, on her way to the airport to meet her idol, Janet Jackson. Teyana was super nervous that she might miss her flight so she had a somber, serious look on her face. The weather was cold & gloomy which explained why she cozied up under a dark hoodie jacket. Even with poor lighting and her serious face, the girl was glowing. At the right moment, Teyana happened to look down at the questions and saw that someone was asking her about which highlighter she was wearing. "Highlighter? Girl, I don't have any makeup on....I'm not doing my face until I get off the plane." She then made a disparaging comment about how to she looked to which everyone responded with overwhelming praise. Teyana then continued to say "this [is] that good moisturizer." I listened closely to see if she would reveal a brand but that never happened. Bummed, I decided to do some digging of my own to see what I could come up with. But instead of a moisturizer, I was introduced to the skin cleanser that Teyana swears by. And, surprise! It's also a cleansing balm. But not just any cleansing balm, it's an even-toned cleansing balm that promises to deliver a brighter, healthier complexion. Best of all, it's made by brand developed for women of color. This 3-N-1 cleansing balm has several notable ingredients including oils, plant extracts, witch hazel (for acne control) and acids to brighten the skin. This is a hard-working product. No wonder why Teyana is so in love. One of my character flaws traits is my impatience. I really wanted to try a cleansing balm but I couldn't bear the thought of waiting several days to receive it. So I'm like "what do I have in my possession to create my own cleansing balm asap?" Dassit! Only 3 ingredients. Coconut oil would be the base of the product. Shea butter would give it a nice, rich texture. Black soap would feel nourishing to the skin yet would create the "soapy" effect when I rinsed (plus black soap can help even out skin). I'll be honest with you, my final product was.....ugly. Hideous is probably a better word. Nothing mixed together properly but I couldn't be bothered with what it looked like. My only concern was if it would serve its purpose. And I'm happy to report that it did! The "mixture" glided over my skin which made it easy to massage. And when it came time to rinse, the black soap came through! My struggle balm left my skin smoother and brighter looking. I couldn't stop touching it. I finished up the routine with an acid-based toner then moisturized. I'm a happy woman. The DIY serves its purpose for now, but I still want to get my hands on the real deal. 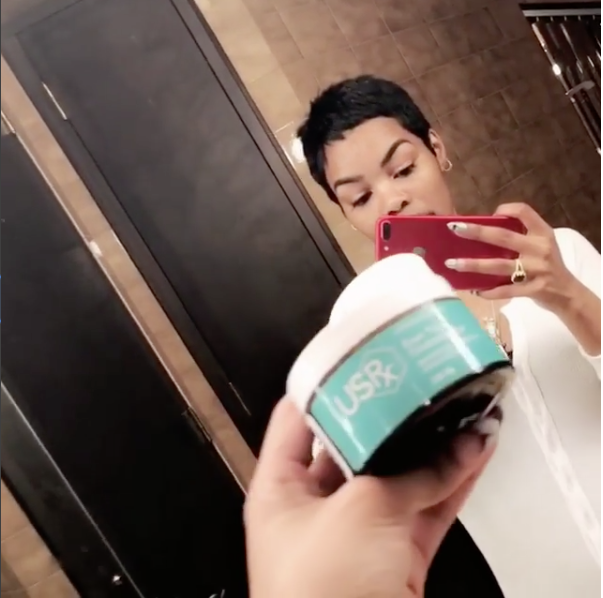 I may write a part 2 to this post because, while searching for the brand of her "good moisturizer," I came up on a couple of Teyana's other beauty secrets. Stay tuned. They sell this product in Target now and it's on sale!